I don’t rep for Camp Chef, or advertise for the company on this site. I won’t help sell equipment I wouldn’t use myself. But readers ask for gear recommendations, with specific requirements in mind. This stove is a good, solid piece of off grid cooking gear. When I bought my Camp Chef double burner propane stove nearly 20 years ago, I never dreamed it would be so useful, get such hard use or last so long! After fleeing the big city lifestyle of Washington D.C. to Boise, Idaho in 1990, my family did a lot of camping, fishing, backpacking and outdoor activities. We soon discovered our small, suitcase-style camp stove worked great for tailgating at a campsite, but was inadequate for the task of all-around elk camp cooking stove. This Camp Chef double burner propane stove has served me well through nearly 20 years of hard use. My brother, Mike Pantenburg, is also my hunting partner, and he moved west shortly after my family did. During elk season, Mike and I hunted Central Idaho. Our camps were spartan and were set up out of the back of my half-ton Chevy pickup. Frequently, we’d get off work on Friday, drive up to the mountains, set up a tarp to sleep under, then get up at dawn to hunt deer or elk all day. We’d come back to camp after dark, tired, hungry and ready for something to eat. Every piece of of our hunting equipment had to earn its place. Gear that didn’t meet expectations never made a second trip! So when I went shopping for a hunting camp stove replacement , it was with specific requirements and expectations. A camp stove has a tough job. It has to function under extreme conditions: The camp stove has to work wherever it is set up, and any stove that is temperamental in wind or cold won’t be considered. The camp stove may be set up under a tarp, or on a pickup tailgate, and it better crank out some heat when called upon! The stove must be easy to light: I hate using the pressure pump on some of those suitcase-sized stoves, (You know, the ones where you have to put your thumb over the hole at the end and pump!) In those pre-dawn hours before heading out on a hunt. I always manage to get gasoline on my hands, or to tear a fingernail while using that pump! The first hunter up generally starts the coffee, and no delays will be tolerated! It must be reliable: If you are miles from town and a piece of equipment breaks, you could be in trouble. It could end up just being inconvenient. But in an extreme situation, you might desperately need to heat water to make a warm drink for a hypothermic hunter. That is not the time to be tinkering with a stove! 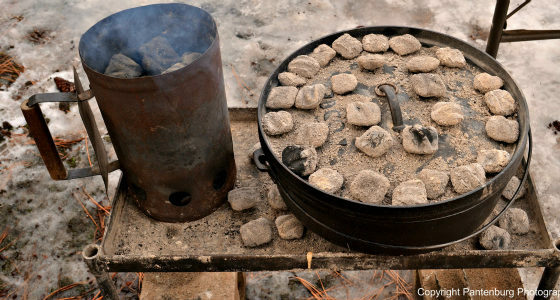 My camp stove needs to be sturdy: I routinely cook for groups, and put heavy cast iron Dutch ovens on the stove, or large containers of water to boil. (My 14-inch deep camp oven weighs 28 pounds before any food is put in it, and water weighs about eight pounds a gallon!) I commonly have a deep 14, full of food, and three or four gallons of water heating at the same time on the stove! 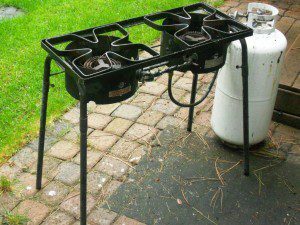 The stove must use a common fuel source: Generally you can find propane just about anywhere there is a gas station. You might not be able to find fuel cylinders, or some of the more specialized fuel sources. My Camp Chef uses a common propane tank that can be refilled virtually anywhere. In a pinch, you can borrow the tank off a barbecue grill! There is a place in your camping/survival gear for a smaller camp stove. The Boy Scout Troop I’m associated with relies on propane cylinder suitcase-style Colemans at every campout. We’ve used those stoves under extreme conditions, and within their limitations, these stoves do very well. But after shopping around with my elk camp stove criteria in mind, I bought a Camp Chef double burner. I have never regretted the purchase, and the stove has never let me down. Reliability is paramount in any piece of equipment that might be included in your survival gear! My double-burner has had a hard life. During hunting and camping season, it is banged around in the back of a pickup or trailer. 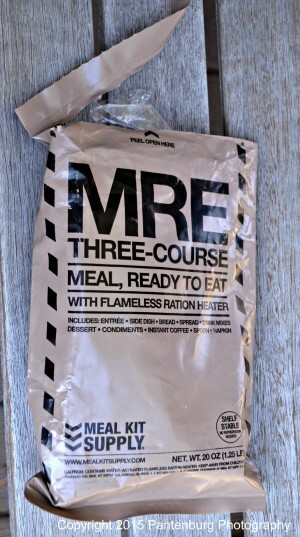 Once in camp, it is set up and used constantly for every cooking task. At one Boy Scout winter campout in the Cascades of Central Oregon, the scoutmasters rigged up a tarp shelter around the back of a pickup tailgate. A Camp Chef double burner, without legs was set up on the tailgate. While the wind blew, and a blizzard raged, the Troop 18 adults volunteers used a Dutch oven and the double burner to create the chili that won the Scoutmaster Chili Cookoff. In the off-season, the double-burner stays set up as a permanent fixture in my patio off-grid cooking setup. We never fry bacon, French fries or chicken inside; the camp stove works quickly and efficiently, and all the cooking smells and heat stay outside. There is no better setup for frying fish for a crowd than a deep cast iron Dutch oven on the double burner. I frequently will have two ovens on top going at once so I can fry fish in one, and cook hush puppies or French fries in the other. No effort is made to protect my stove from the elements. Generally, all I ever do in the winter is brush off the snow, turn on the propane and light it. Even though my double-burner has had excessive hard use, it still lights every time, and continues to perform with monotonous regularity. While some of my hunting/survival gear may need updating, when it come to my double-burner, there is no replacement plan in sight! For more gear reviews, click here!